The most common response for “Confidence in future of franchise” was 9 with 46.6%. Confidence in the future ranged from 1-10, while 98.9% of respondents answered 6 or greater. 69.3% of respondents feel the Rays have a shot at the playoffs in 2008. This is up from 63.4% last week. 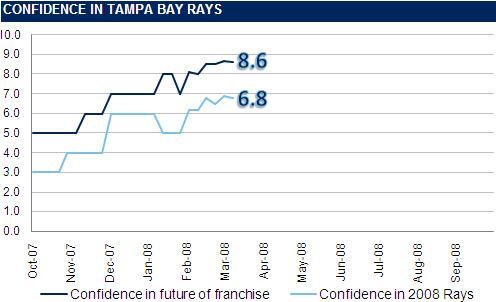 96.6% of respondents feel the Rays should be at least a .500 team in 2008. This is up from 91.6% last week.